Smarty the Chow-Chow x Bull Terrier at 2 years old from Botswana—"Smarty's father is a quite protective Bull Terrier, her mother a calm and reserved Chow. As expected, she inherited prick ears from both parents and short hair from her father. Her tongue is pink-blue mottled. 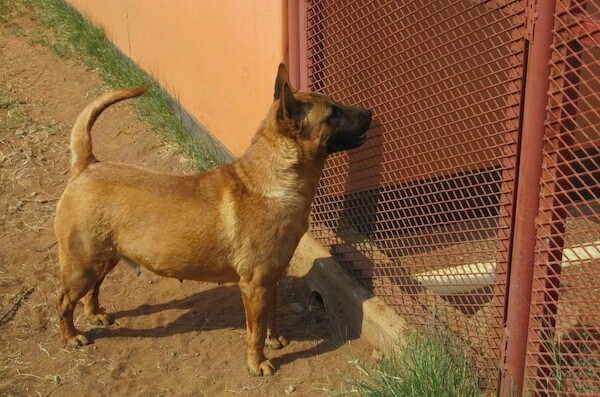 Smarty is very friendly with other dogs and with people, but she has a very strong uncontrollable game drive, fearlessly chasing baboons entering our yard." The Bull Chow Terrier is not a purebred dog. It is a cross between the Bull Terrier and the Chow Chow. The best way to determine the temperament of a mixed breed is to look up all breeds in the cross and know you can get any combination of any of the characteristics found in any of the breeds in the hybrid. Not all of these designer hybrid dogs being bred are 50% purebred to 50% purebred. It is very common for breeders to breed multi-generation crosses.